Books on preaching abound. And those of us who make a regular practice of reading such books must sift through the available volumes to decide which ones merit our attention and which do not. 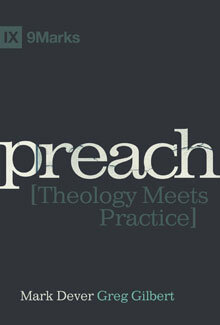 Full of homiletic wisdom and insight, Preach: Theology Meets Practice, co-authored by Mark Dever and Greg Gilbert, most assuredly falls in the former category. The subtitle of the book is reflected in its three-part division: Part One: Theology, Part Two: Practice, and Part Three: Sermon Transcripts. Recognizing that the monologue sermon is scandalous in a culture saturated with images, Part One is a carefully composed and rigorous defense of Christian preaching. The argument is grounded in the basic observation that the God of the Bible is a speaking God. His word gives life to his people, and, as a result, his people are in desperate need of hearing his word. As the proclamation and explanation of the word of God, faithful preaching is, therefore, a necessity for the life and health of the people of God. Anyone interested in why Christians have, for centuries, engaged in and sat under preaching will find this part of the book valuable. And it is not written for pastors exclusively. Lay persons interested in what is supposed to be happening when your pastor preaches week after week will also enjoy and appreciate this part of the book. Taking up the topic of “Practice”, Part Two includes chapters on what to preach (5), sermon preparation (6), structure (7), delivery (8) and review (9). I found this part of the book especially helpful, and have modified the way I prepare sermons as a result of reading it. I also particularly appreciated the section on application and have incorporated elements of the authors’ method into my own work. Part Two would have been stronger had the topics of chapters six and seven been reversed. The discussion in chapter seven, which briefly introduced the parts of the sermon and their functions, would have led nicely into chapter six, which discussed the process of moving from biblical text to finished sermon. With the way these chapters are ordered in the published version of the book, the reader is instructed on how to prepare each part of the sermon before actually being introduced to the nature and function of those parts. This is no reason to pass over this valuable book. Simply know that chapter six will make more sense once you’ve read chapter seven; or, perhaps, simply read them in reverse order. Part Three models the weekly sermon review process (introduced in chap. 9) in which each of the authors participate on Sunday evenings after they’ve preached. Two sermon transcripts are included, one from each author, along with comments, both charitable and critical, and feedback from the other. This final part of the book helpfully illustrates much of what has been taught in the first two parts. And, given that most preachers do not engage in a weekly review of their homiletic work, this section should prove interesting and instructive to many. Regular affirmative and corrective sermon review could go a long way in improving much of our preaching. This book is not just for preachers. Those who listen to preaching will better understand its necessity and importance. Those who do preach will learn and grow as practitioners of their homiletic craft. This is my new favorite book on preaching, and I am happy to commend it to you.